Rob Roy, the Scottish Robin Hood, was born as Robert MacGregor at Glengyle, northwest of Loch Katrine. He was baptized on 7 March 1671. 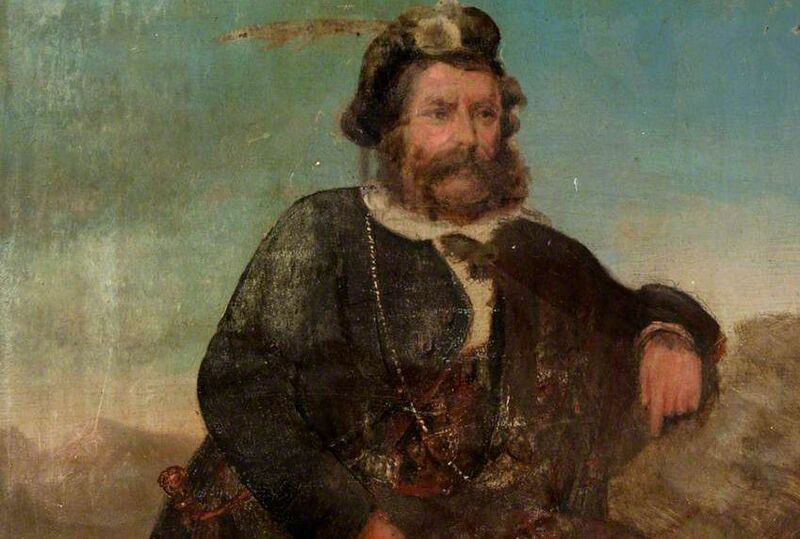 He became known as Rob Roy (from the Gaelic, meaning ‘Red Robert’) because of his ginger hair. He became a cattle rustler and extortionist at an early age and his father took an active part in the Jacobite rising of 1689 led by Viscount Dundee to support the Stuart King James who had been deposed by William of Orange. His father was jailed for treason. Rob Roy became a successful businessman but in the autumn of 1711 he overextended himself and defaulted on a loan. Rob was appalled that “when I was on top of my bussines [sic]” action would be taken that might “brake my credit”. In June 1712 James Graham, 1st Duke of Montrose, one of his creditors, denounced Rob as a bankrupt and offered a reward for his capture. Rob fled to a remote area of the highlands. From there he seized all the boats on Loch Lomond, slaughtered a herd of Montrose’s deer and supplied military intelligence to the Hanoverian Duke of Argyll. He encouraged Montrose’s tenants not to pay their rent and in January 1716 occupied Falkland Palace, which he plundered. In June he was charged in absentia with high treason. In November he kidnapped one of Montrose’s aides and demanded the cancellation of all his debts. The demand was unrealistic and he freed his hostage after two weeks. On 3 June 1717 Rob surrendered to the Duke of Atholl. However, Rob believed he had been tricked on and on 5 June he escaped from Atholl’s prison at Logierait. On 25 June he issued his Declaration of Rob Roy to all true lovers of honour and honesty in which he claimed that he was the victim of political conspiracy. The next month he returned to his thieving ways and he threatened arson if Montrose built barracks at Inversnaid. In January 1719 a reward of £200 was offered for his capture. In March 1720 he attacked and wounded a party of soldiers. On 19 October 1725 he formally surrendered to General George Wade at Dunkeld. In 1729 his soldier sons were charged with stealing cattle and horses and it was only Rob’s oratory that saved them and him from prosecution. His wife had been active in the family business too. In 1725 she had collected blackmail rotection money for her husband. Rob Roy died on 28 December 1734.